Worldwide Fred is a lighthearted purveyor of the silly, the clever, the ridiculous-yet-compelling. (I previously posted their "Zing" foodfighting utensils.) 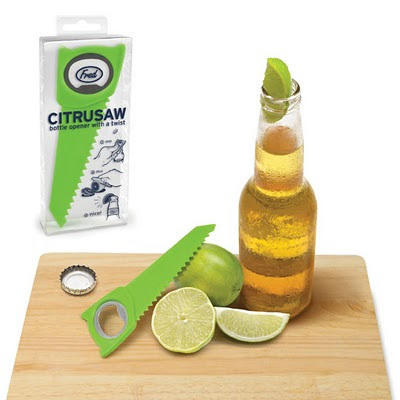 Anyway, here's another gem to kick off your weekend: the CITRUSAW. It combines the two tools you need for a good Corona: a bottle opener and a lime-wedge cutter. Sure, you have to hold the tool by the blade when opening the bottle - but since it's a (plastic?) serrated blade just sufficient to cut limes, that's probably okay. Keep up the good work, Fred!